The Phab 2 Pro is a strong effort and value on its own, made sweeter by the Tango AR. Your mileage may vary with Google’s experimental tech, but it's undeniably ripe with potential and novelty. As Lenovo’s first serious crack at breaking into the stream of conversation-sparking smartphones, the Phab 2 Pro is an interesting place to start. It’s a hulking, chiseled Android Marshmallow device, which doesn’t earn it any points for originality. But, here’s what does: it’s the first phone to ship with Tango, Google’s new environment-scanning augmented reality (AR) setup. The Phab 2 Pro serves as the launch-point for the experimental technology that could very well go on to be a household name in the next wave of smartphones, if not even sooner in the company’s own Moto Z as a rumored Moto Mod. Sure, Tango’s current app count is small, but it’s plentiful enough to showcase its potential, allowing users to flex their inner interior decorating skills, build a Hot Wheels track in the middle of the room, and inject silly holograms of sorts into the real world, to name some examples. Although not without its issues, the tantalizing Tango functionality is undoubtedly this phone’s killer app. But, is that enough of a reason to buy this phone? For $499 (£499), you’re getting a lot of phone for the money, with a next-gen feature that makes it stand out from the rest, to boot. But without Tango, the Phab 2 Pro comes up a bit short on reasons to buy in compared to more powerful alternatives, OnePlus 3T and the ZTE Axon 7. Looking for this Tango-enabled phone? You won’t find it in your local brick-and-mortar retailers. It’s only available online through Lenovo’s site (US, UK) for $499 (£499) plus tax. The Lenovo Phab 2 Pro comes unlocked, but will only work on GSM networks. In the US, this excludes Sprint and Verizon from the supported carriers list. This price puts it in direct competition with devices, like the OnePlus 3T, Nexus 6P and the iPhone SE. 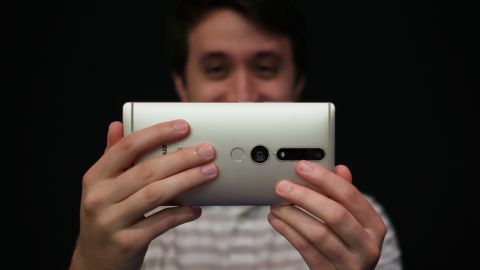 But, of course, only the Phab 2 Pro has the ability to Tango. Plus, it’s just an absolutely massive phone, which could qualify it as a capable tablet replacement for some. If you’re after a smartphone that will fit easily into your pocket, the Phab 2 Pro isn’t it. This 6.4-inch device weighs 259g – over a half pound, and just shy of the Apple iPad Mini 4 – and measures up at 179.8 x 88.6 x 10.7mm. It’s just massive all around. But, its large size serves another purpose than just its vibrant 2K screen. It provides enough wiggle room for Google’s Tango technology inside, too. Jumping straight to the phone’s backside, the space made for the multi-camera setup takes the place of where you’d usually find a fingerprint sensor. Don’t worry, it’s here, but much lower and thus, more awkward to reach, than you might be used to. The matte-textured, gun metal enclosure of the Phab 2 Pro gives off a familiar look and feel, like the OnePlus 3, if it had sharp edges. Flipped around to its front, the glass covering the IPS panel takes on a bit of a curve around its edges, which definitely gives off a high-end quality. However, the thick bezels surrounding the screen take away from that a bit. Around its thick, flat edges, you’ll find the usual arrangement of buttons and features. On its bottom, there’s a micro USB port fit between two speakers. Given the sheer size of this phone and its bezels, it would have been nice to have sound firing toward the user instead of away from them. The volume rocker and power button are easy to access without looking, as is the 3.5mm jack on its top. Lastly, the left side hosts the SIM and microSD card tray.